The other night I did a cooking demo for eight people at Jessica Bard’s Kitchen-Class at Warren Cutlery here in Rhinebeck. I’ve done demos onstage in front of big audiences, and to people milling around at a farmers market, but teaching a small group like this was a first. I had lots of fun hamming it up and spouting off and cooking up a storm, all at once. I got there late (poor organization), forgot to start things in time, had trouble with the induction cooktop, all kinds of mini-crises, but I just had a great time and hope I get to do it again. I made a southern-inspired dinner with Crispy “Smothered” Cornish Game Hens with Mushroom Gravy over Baked Grits (southern polenta! ), New-fangled Collard Greens (the fiddleheads I promised were not to be found anywhere), Hoppin’ John Salad, Bourbon Pecan Pie with Julep Whipped Cream, and Strawberry Ice Tea. On the right is yours truly mercilessly spatchcocking a poor helpless game hen. 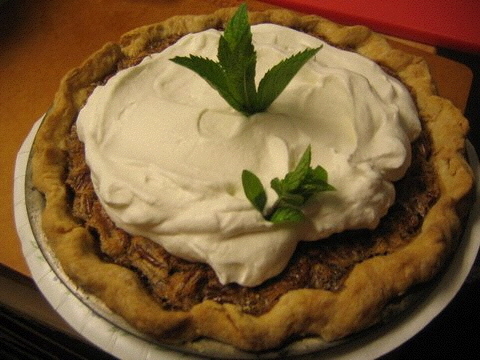 The photo below is my pie, photographed beautifully by Jessica Bard. I got scooped by The New York Times this week. Monday I sent Ulster Publishing a column about kids cooking, which included a round-up of favorite kids’ cookbooks. They’ll probably run it next Thursday–they’ve been needing a long lead time lately. Then on Wednesday I bought a copy of the Times, which I do once every couple of months or so, just to sort of see what’s going on in the food world. And lo and behold, they had a cover story on kids cookbooks, including the general trendiness of kids cooking. Now to stroke my ego, my husband says the big food folk follow me around and see what I’m writing about so they can do it too. “Look, Saveur just did avocados–they’re following you!”–that sort of thing. But I don’t know how the old NYT can see something I did that didn’t even see print yet! Rolando says, “They’re hacking into your computer somehow, saying ‘Let’s see what Jenny B.’s up to. '” Pretty cute. And Ma, if you’re listening, those grits were a huge hit. JoAnn Clevenger has owned Upperline restaurant in New Orleans for 25 years, serving classic New Orleans “food with an adventure.” At the IACP conference in New Orleans last week, as part of a moving panel discussion moderated by Pableaux Johnson, the warm and elegant Ms. Clevenger spoke with great emotion on not being able to return to her beloved restaurant for a scary three weeks after Hurricane Katrina blew through town. She talked about the intense relief of seeing that her restaurant had sustained no flood damage and the horror of the putrid smells that wafted out of an establishment that had had no electricity for refrigeration all that time. Once they were able to clean up and reopen it was really hard to get what they needed to operate the restaurant well and safely, that many of the staff were no longer in town and most of the ones who had stayed were without homes, facing continuing difficulties in getting to work. One young man dutifully traveled three hours each way to get to his job at Upperline. On my last night in town I dined on luscious raw oysters and huge heads-on “barbecue” shrimp at the French Market Cafe on Decatur Street in the French Quarter, an area that was not as affected by the storm and flooding as other parts of the city. But the quiet bartender who served me my dinner with some Abita Amber ale to wash it down told me that he had lost his home and had to relocate to Atlanta for 5 1/2 months. He was lucky, he said, though, because many residents of New Orleans had no cars and couldn’t afford to leave. “But at least something good came out of all the misery,” he told me, “The seafood has been incredibly good since the storm: the oysters, the shrimp, it’s all exceptional now.” He explained that all that water had somehow cleaned out the ecosystem so the seafood could sort of start from scratch. A T-shirt seller in a nearby store was looking at the bright side, too. Recently he bought a house that had flooded severely, for a song, and was now renovating it to live in. “It’s not all bad,” he said. Everywhere we conventioneers seemed to go local residents thanked us profusely for coming and stimulating the economy of the still-hurting city. Service was warm and gracious; locals recognized you if you returned to an eatery or to the conference ballroom for a meal, open to talking about their personal experiences after Katrina. They seemed devastated, still down, working two or three jobs to get by, yet optimistic, trying to find the good in what had happened, hoping for the best for the future. Reba, a server in the hotel, remembered me at breakfast and told me that because she is the mother of young children she works only 12-hour shifts, 4 a.m. to 4 p.m. but that some of her co-workers at the hotel were working 24-hour-shifts. For excellent overviews of how Katrina has affected the lives of the people of New Orleans, I recommend two books that I read right before my trip, 1 Dead in Attic: After Katrina by Chris Rose and Gumbo Tales: Finding My Place at the New Orleans Table by Sara Roahen, the first emotionally intense and the second more food-focused, both beautifully written. 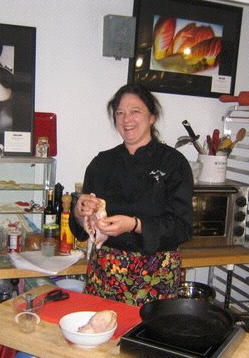 Also, my new conference pal Judith Klinger writes nicely about her take on New Orleans in her blog AromaCucina.com. I’ve been looking forward to this for so long and feel so blessed and glad to be here in New Orleans at the IACP conference. I’m all settled in and fried from flying, but all fired up to start tomorrow with some meetings with an agent and magazine publishers. And of course all my fellow conference-attenders, whom I’m very excited about meeting. Got in late but had to grab dinner so I cabbed it over to Cochon for some boudin balls (deep-fried sausage–how can you go wrong?) with a sweet and spicy grainy mustard sauce and pickled peppers. I followed these delectable porky tidbits studded with liver and rice with more porky wonderment: the Louisiana cochon de lait, a classic country Cajun dish gone upscale, fine pig roasted and formed into a cake over peppery pig reduction, with luscious hammy nuggets, turnips and cabbage. I washed it all down with a nice bitter Abita amber which complemented the swiny sweetness better than any wine I could dream up. Tomorrow the conference! Hip hip hooray!